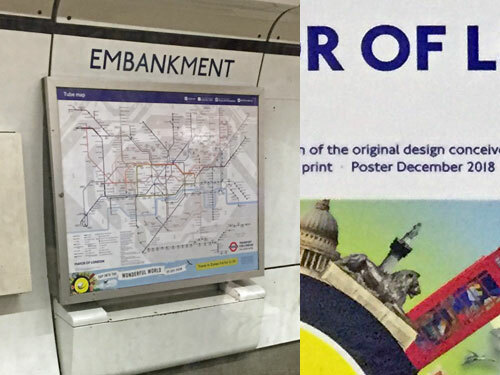 A couple of months ago, coincident with the introduction of the December 2018 tube map, these splendid heritage posters popped up all across the tube network. They appeared, no more than once per platform, in place of the vinyl tube map stuck to the outside of the 'Station Closed' sign. Importantly they were only applied to the older kind of 'Station Closed' sign, not the new sort which has a glass cover. But this meant a significant number of tube map posters vanished from the Underground network overnight. That's the short version. Here's the 2000-word version I wrote back in December. Ian Visits, courtesy of a Freedom of Information request, has an explanation of precisely why this happened. "Any printed material placed in the tube platforms have to comply with a fire resistance regulation known as S1085, which covers flammability, smoke emission and toxic fume emission in case of a fire. A poster placed behind a glass sheet which is itself rated as compliant is perfectly fine. But a poster mounted directly onto a sheet of metal, with no protective glass would be a problem." For many years, this has forced TfL to go down a different path to produce these maps. "The Tube map that sat in the station closed board frames require a specialist production process involving fire-proofing and lamination which means they are more expensive to produce and maintain than the maps or customer information that sit in regular poster frames." And that's a ten thousand pound print run TfL can no longer afford. "Removing the map product from station closed boards equates to approx. 21k annual saving. 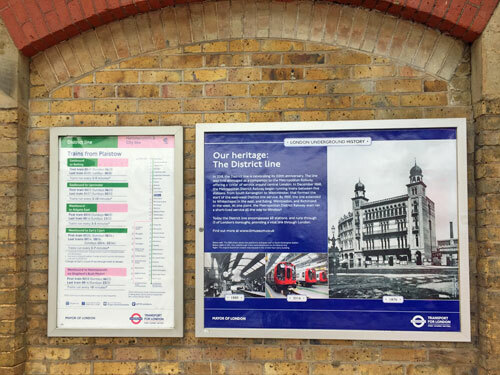 Opting for a permanent product replacement such as the heritage posters allows us to reduce annual costs and enhancing the platform experience with interesting content." Unfortunately TfL slapped up the new heritage posters before fully mitigating the disappearance of the tube maps underneath. When I surveyed part of the network in December, visiting 72 platforms altogether, I discovered that 22 no longer displayed a tube map and five no longer displayed any maps at all. That's no great success, and I said so. It's exceptionally rare for TfL to respond officially to something I've posted - I could count the number of times it's happened on the toes of one sloth. But in this case their Senior Press Officer got in touch by email within a few hours and explained the following. "We have noticed with interest your blogpost this morning about the new heritage boards at stations. Just so you are aware - we are working to put Tube maps up at any platforms that no longer have one due to the new heritage boards. Additional poster frames are also planned to be installed at stations in the coming weeks. And just for the avoidance of doubt - this was all planned prior to your blogpost this morning." So I've waited a couple of months and gone back to see what's been done. If you want a spoiler, a costly process has been undertaken inconsistently without yet finishing the job. Firstly I revisited the five platforms I'd spotted no longer had any maps at all. 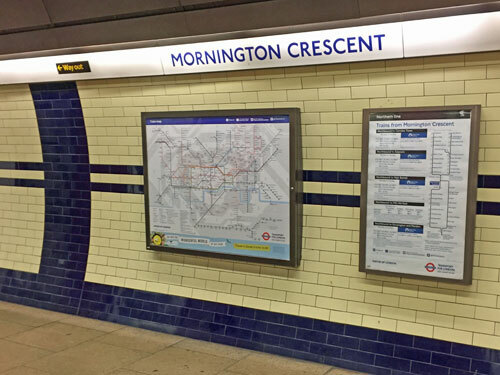 At Mornington Crescent southbound, kerching, a tube map was back. The platform only has one map-sized poster frame, which previously had been covered over by a heritage poster leaving passengers bereft. But that frame once again contained the necessary map... so, one success. At Embankment northbound, same again, a fresh map had appeared. I was only for there a couple of minutes but observed four different people stop to use it, which goes to show how inconvenient its disappearance must have been. Also notice that this is a brand new vinyl tube map, print date 'December 2018', using the same expensive fireproofing TfL had been so keen to avoid. If there is money to be saved, it is not being saved yet. At Stepney Green and Bromley-by-Bow, eastbound, similar action has been taken. 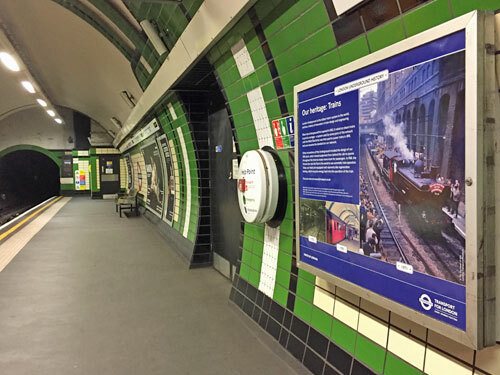 A bespoke tube map has been printed and stuck up in place of the heritage poster stuck up prematurely, so passengers once again have something to peruse. But at Plaistow this has not happened. Plaistow's eastbound platform displays no maps whatsoever, because the only space that used to hold one continues to celebrate the District line's 150th anniversary. 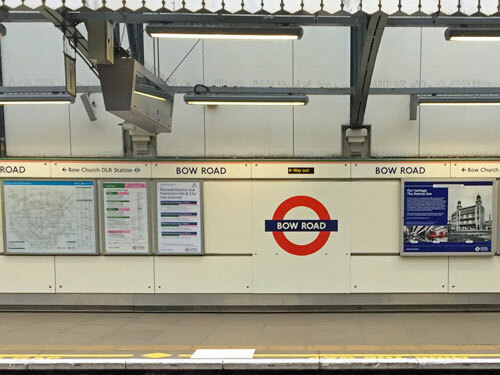 It's baffling that Stepney Green and Bromley-by-Bow can have been updated, but Plaistow in identical circumstances two stops down the line has been overlooked. So far that's 20% failure, 80% success. Next I went back to the three platforms which had previously only displayed a night tube map, and no longer any map showing daytime services. At Holborn, success. Before December each platform had displayed a tube map and a night tube map, but then the tube map was covered over leaving only the far less useful overnight alternative. Now a proper vinyl map is back, on both platforms, restoring customers' ability to plan ahead. n.b. The night tube maps on the Central line platforms at Holborn are still December 2017 versions, which show Whitechapel as closed and the Night Overground extending only as far as Dalston Junction. That's very poor asset management. The more carefully I look, the more I'm convinced that TfL don't have a overall grasp on what maps they have in which frames on which platforms. n.b. Also, the new fireproof tube map on the westbound platform has been stuck on really badly, much too low in its frame, revealing that the blue heritage poster is still there underneath. 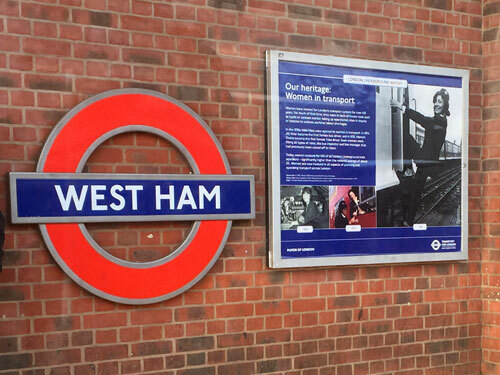 At least that should mean TfL won't need to print a whole new set of heritage posters when this debacle is finally resolved. But when I went back to Liverpool Street, nothing had changed. Passengers on the eastbound platform can view two night tube maps, one at each end, or a blue heritage poster in the middle, but no tube map. It may not be a mapless platform, but neither of the maps provided are what's required. So that's two failures and six successes out of eight. Next I double-checked my local station, Bow Road, to see what had happened on its platforms. Nothing new had happened. Before December Bow Road's platforms used to display a tube map and a tube/rail map, but then the tube map was covered over and now only the tube/rail map remains. TfL have obviously decided that a tube/rail map will do, so no money needs to be spent adding an expensive sticker tube map as well. 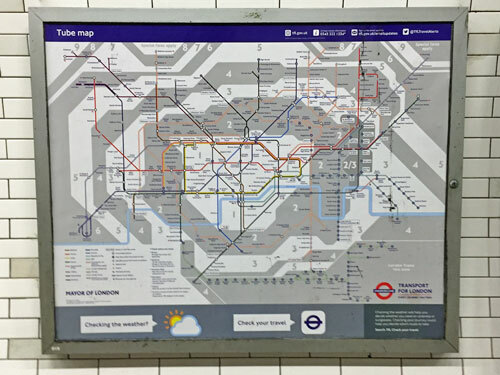 A pair of maps - one tube, one tube/rail - has been the default display on a very large number of tube platforms for many years. On such platforms the tube map was always on the Station Closed board, and the tube/rail map usually in an ordinary frame alongside. Covering over every fireproof tube map has left just the tube/rail map, which isn't optimal but avoids wasting any additional resources at this stage. Hopefully the glass frames will get tube maps the next time a reprint is posted, but for now no serious navigational damage is being done. While I was travelling around the network I also spotted several other idiosyncrasies. Bethnal Green (eastbound) has been given a new fireproof vinyl map despite there being a tube/rail map passengers could consult instead, suggesting that the latest rollout has been inconsistent. 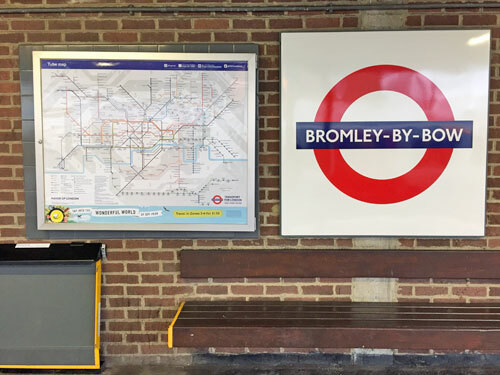 West Ham's northbound Jubilee line platform has been given a new fireproof vinyl map but its southbound counterpart, in an identical state of maplessness, has not. And Paddington eastbound on the Bakerloo line turns out to be another entirely mapless platform, with only a blue heritage poster and a big frame where a paper tube map could be, but isn't. This is Paddington, for heaven's sake, not some minor backwater. So when TfL's Senior Press Officer told me "we are working to put Tube maps up at any platforms that no longer have one due to the new heritage boards", I know of at least three platforms that have been overlooked (Plaistow, Liverpool Street, Paddington) and there are probably several more. And when he said "additional poster frames are also planned to be installed at stations in the coming weeks", that number of weeks is greater than seven, because I've seen no evidence anywhere yet of any new frames going up. Here's the overconfident finale to the aforementioned Freedom of Information request. • In the remaining 54 stations where the only map available is held on the station closed board, we have made the latest version of the map still available as a temporary measure while we install additional regular frames to hold the lower cost map product. I can confirm that TfL's "thorough investigation" was not as thorough as it should have been, and has therefore disadvantaged customers. I can also confirm that they have not "made the latest version of the map available as a temporary measure" at all of the stations where it's required. Instead, by sticking up heritage posters before they had considered the consequences of their actions, they've ended up spending more money on "expensive to produce" fireproof maps than originally intended. One day all of this will be sorted, and it will be no problem at all. Every platform will have a tube map, and numerous platforms will have a heritage poster passengers will enjoy. In the meantime this has been a classic example of a new project implemented before sufficient thought had been given to the consequences, imperfectly mitigated after deficiencies had been spotted, and glossed over with reassuring words not fully backed up by actions.